Modern piano keyboards make use of 52 white keys and 36 black keys, totaling to 88 keys on a piano. which includes seven octaves plus a minor third (from A0 to C8). The black ones are raised and are set farther back than the white ones. Each key on the keyboard represents a specific musical note. The white keys on a piano keyboard signify the seven note names (A-B-C-D-E-F-G) and the black keys are used to identify sharp or flat notes. The black keys always appear in consecutive groups of two and three, and if you use your imagination, you can think of any set of two black keys as a pair of chopsticks and any set of three black keys as the tines on a fork. 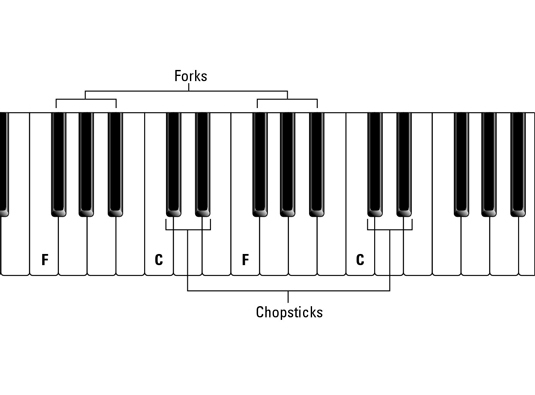 Chopsticks starts with the letter C, and fork starts with the letter F.
To the left of the chopsticks (two black keys) is the note C.
To the left of the fork (three black keys) is the note F.
Moving up from C you have the notes D, E, F, G. When you get to G, think “Go” as in “go back to the beginning of the alphabet.” The alphabet pattern repeats over and over in octave groupings, which are groups of eight white keys and the black keys between them. Sharp is used for a black key to the right of (or higher than) a white key. Flat is used for a black key to the left of (or lower than) a white key. A knife is sharp and lies on the right side of the plate. A napkin is flat and lies on the left side of the plate. Just remember chopsticks and forks, knives and napkins, and you’ll never forget the names of the keys on a piano . . . but you may feel a little hungry. Because each of the black keys lies between two white keys, each black key has two names, depending on the white key you approach it from. For example, the black key to the right of C is C-sharp, but it’s also D-flat.